Five years ago we packed up the few things we still owned, turned in the keys to our Nashville apartment and left our old lives. On August 9, 2012 we boarded a plane bound for Tokyo, Japan and started what was, unbeknownst to us, the first chapter of a very different story than the one we had been writing previously. In the intervening five years we’ve done more than we can possibly imagine, and yet it feels like the blink of an eye. It’s sometimes hard to believe everything we’ve done, and how our lives have changed and yet it feels like that time has passed more quickly than we ever could have imagined. In any case, that’s enough preamble; the real point of this post is a little infographic I’ve thrown together to mark the occasion. It’s a simple mashup of some stats about the last five years of our lives that may or may not interest you. Have a look, and let me know what you think! Happy belated blog-iversary!! 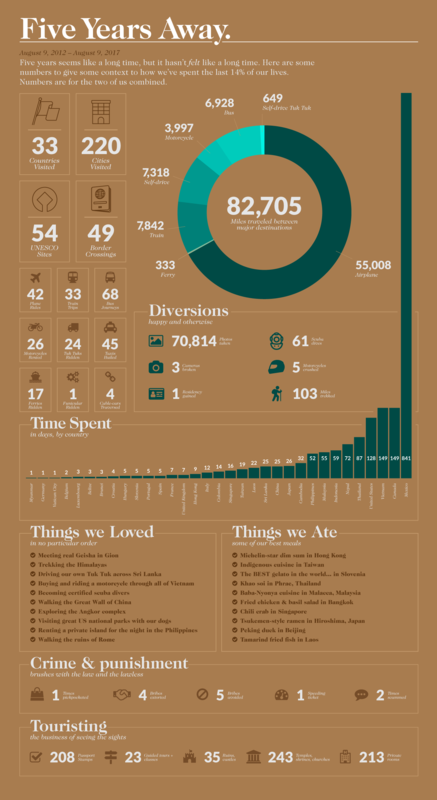 Have been following you off and on for the past couple years and love your infographic!! Wishing you many more plates of yummy grub & passport stamps. Wow, 5 years, this is something! I’m also leaving my own travel dream, but till now it’s less than a year. Good luck with your other trips and have fun during your life, there’s only one! Regards! It’s really interesting you kept all the records for your five year travel and it is very inspiring for me. Thanks for sharing i am also going to keep record for my travel trips yearly. The blog are about Five Years Away . I hope for you Five years ago we packed up the few things we still owned, turned in the keys to our Nashville apartment and left our old lives. I agree with you . Thanking you for . This blog are so many beautiful imagination for get you . I appreciated for you !!!!!!!!!!!!!!!!!!!!!!!!!!!!!!!! Tony and Stephenie, thank you so much for your wonderful travel stories. My husband and I have traveled to many of the places that you have and we consider ourselves gypsies, we want to see it all and love being on the road even though at 72 and 76 years old, you would think my husband and I would be happy to settle down but we aren’t, we have been married for 52 years and still trek, stay at guest houses try to eat with the locals and absorb local culture, otherwise why be out there. Your story on Sri Lanka so inspired us that we are planning our next trip there this coming April and want to visit many of the places you described in your blog, so thank you. Our friends from Calgary, Alberta moved to Lake Chapala 10 years ago and when we visited last year we had the same feelings about the city as you both did, a bit tame for our liking and not what we travel for but understand the comfort and like mindedness that some expats look for, they are very happy there and expense wise it allows them to have a life style that would be impossible in Canada. Hoping that you are both well and still on the road. I sobbed over Emmy Lou’s passing and think that taking your “children” on the road with you is very brave, challenging and wonderful. Looking forward to the rest of your adventures!